Farberware Earth Pan 10 Piece Cookware Sets are coated with a unique SandFlow nonstick coating that is safe for cooking foods for the whole family. Nonstick coatings don’t allow foods to stick to the pan or skillet making cooking and cleanup easier. Nonstick cooking utensils have been in use since the mid 1950s when the first patent was granted and permits were obtained for the manufacturing of nonstick pans. However, concerns have since been raised about the negative health effects of PTFE coated cooking pans and of PFOA emissions from them. PTFE is the original coating used by Teflon on the first nonstick cookware. PFOA is a type of gas that is emitted from PTFE coated pans. Earth Pan 10 Piece Cookware with SandFlow nonstick coating are free of the dangers of PTFE and PFOA. SandFlow is processed in a technique that ranks among high technologies in applications such as microelectronics, medical engineering, machining tools and optics. As the name implies, it is a sand based product and sand is the main ingredient in glassware and silicone bakeware. 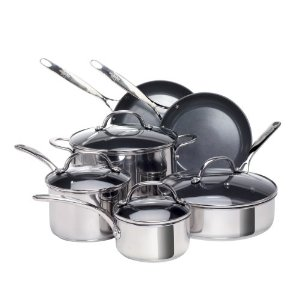 Earth Pan 10 Piece Cookware Set is eco-friendly, highly polished stainless steel with a thick capped base of aluminum for even heating without hot spots, so that foods cook evenly across the pan. Tests were done with the Earth Pan 10 Piece Cookware in which pancakes were cooked to a uniform color on both sides. The Earth Pan 10 Piece Cookware Sets include a one and a half quart saucepan with lid, a two quart saucepan with lid, an eight inch skillet, a ten inch skillet, a three quart sauté pan with lid and an eight quart stockpot with lid. Care instructions for the Earth Pan 10 Piece Cookware Set say “dishwasher safe”. Nonstick cookware of any kind should never be subjected to the extremes of a dishwasher. Long term high heat and high velocity water spray is great for cleaning glasses, stainless steel pans, dishes and non-coated aluminum, but nonstick surfaces suffer injury from these conditions. If you would not use metal spoons, forks or spatulas on nonstick cookware, then you would not want to place them into the dishwasher to be blasted. To further protect the nonstick surfaces of the Earth Pan 10 Piece Cookware Sets, metal ‘wool’ cleaning pads and abrasive cleaners must never be used. If, for any reason, food clings to the nonstick coating, simply pour a little soapy water into the pan and let it soak for a few minutes then swish the soapy water around in the pan and the food will let go. Take care of your Earth Pan 10 Piece Cookware Set and it will serve you well for a long time.